One of the most important parts of any PC is the hard disk. When you buy a new computer it always seems so large. The capacity appears so much that you can’t imagine filling it up. Over time though files get larger you save more and more work to it and the next thing you know you PC is slowing down to a crawl and you keep getting warnings about the disk being full. The good news however, is that upgrading a hard disk is a fairly simple operation if you have a desktop PC, its a little harder in laptops but it’s still possible. If you have a desktop style PC the physical aspect of replacing a hard drive is very simple. You remove the power and data cables from the back of the existing disk and pop the new one in. There are, however, some steps to take before this operation is attempted. First, you have to transfer the data from your old disk to the new one. If your PC will take more than one hard drive at a time then you can just place the new hard disk into the space provided and copy all your data across that way. This way you can keep your old drive for extra space. If you don’t have extra space for a hard drive you’ll need to back-up the drive to CDs, USB pen drives ors DVDs and then copy it back to the new drive once you’ve installed it. 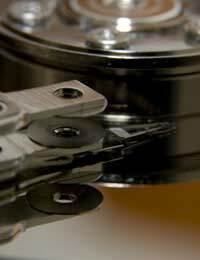 Hard disks are available in two main sizes; 2.5in and 3.5in, though there are other sizes for different uses. In a full size desktop PC the usual hard drive option is a 3.5in version with 2.5in used in laptops. It’s highly unlikely that a normal PC would have a laptop sized hard drive installed but make sure you check before buying a replacement. The other consideration when buying a hard drive is the type of connection it has. The overwhelming majority of more modern PCs will have an ATA connector. This is sometimes referred to as IDE and ATAPI. This has been the standard type of connector for several years now and is only recently being phased out in favour of the faster SATA connection. If you’re replacing a hard disk in a laptop you’ll need a 2.5in size unit. It can be difficult to break into a standard laptop computer so check to see how much surgery you’ll have to do on the machine before you purchase a bigger drive. The other way to increase you hard disk space is to dump all the rubbish you might have collected over the years. Simply emptying wastebasket can reclaim a surprising amount of space. Also many PCs are sold with a dizzying amount of free or evaluation software that you might never have used or have no use for. Getting rid of these applications can also get back all important disk space. If you’ve deleted all you can and you’re still tight for space the alternative is to archive all your documents to CD or DVD. You might have documents that you want to keep and you can but there’s no need to keep them on you computer unless you use them everyday. Save them to a disc and store them somewhere dry and safe. This way you’ll clear space off the hard drive but not loose your files. Getting extra disk space is an extremely simple operation. You can either install a new one with the minimum of fuss or delete the files and applications you never use. This way you’ll extend the usefulness of your computer and give your PC a new lease of life.